The entrée.DOT software module is designed for NECS entrée users who purchase from Dot Foods, the nation's largest food redistributor. If you currently use the Dot Expressway web site for your ordering, etc., you will find that this module compliments it and makes some processes easier and faster. It allows entrée users to automate procedures related to costs, pricing, purchasing and receiving, along with the ability to make your entire order guide from Dot Foods available to your customers. Items purchased from Dot Foods can be integrated into the NECS entrée system providing you the ability to drastically increase the number of products you can supply to your customers – without having to increase the size of your warehouse. All items purchased from Dot Foods will flow into your Electronic Order Pad ipad application and entrée.NET, to provide you with more selling opportunities. This module communicates directly with Dot Foods internal computer systems via Internet based data transmissions. 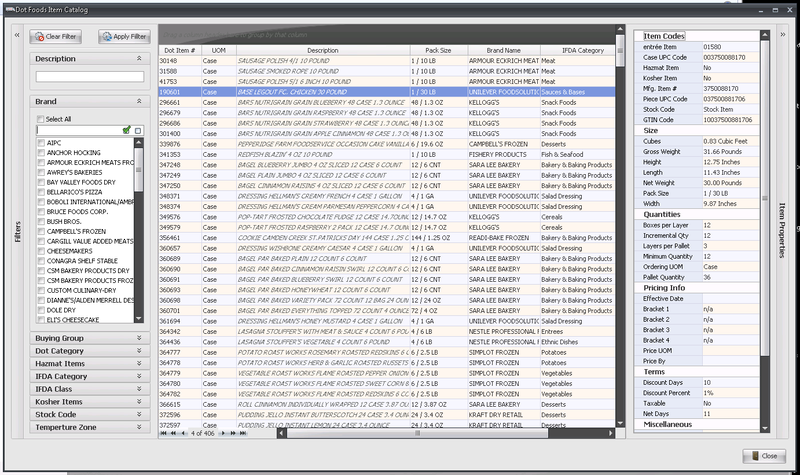 The Dot Management Sales Review screen is used to view pending sales and provide a historical view of the sales of your Dot Foods catalog items. This powerful screen allows you to easily observe which products are selling well and use this information to adjust the items you import from the Dot Foods catalog. Make changes to Special Order Items on customer invoices. 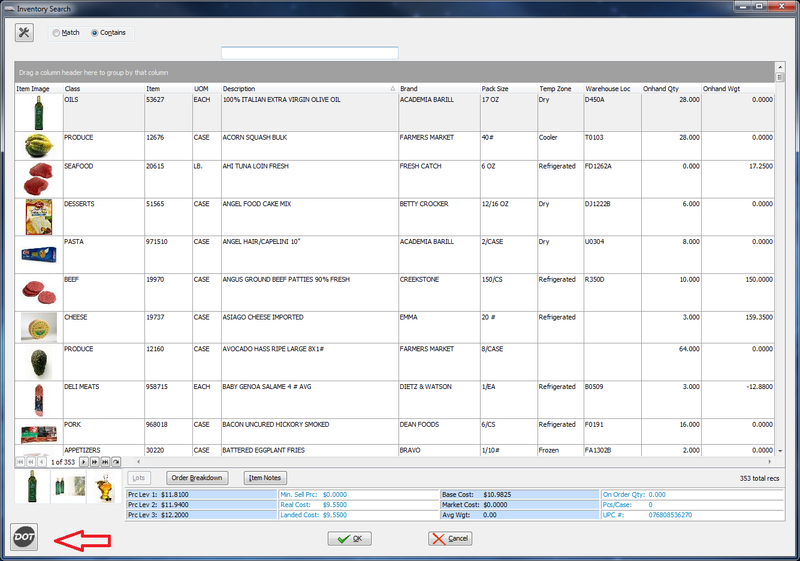 Edit invoices, sales orders, and/or purchase orders associated with the selected line item. Print invoices, loading sheets, sales order confirmations, sales order loading sheets, sales order releases, and/or purchase orders associated with the selected line item. Properties, Filters and Columns help you easily find items or groups of items you are looking for. The entrée.DOT interface allows you to define preferences as to how your entrée system will interact with Dot Foods. This includes defining how Special Order Items and Drop Ship Items should work, including your default price markup percent, lead time and required customer deposit percent. 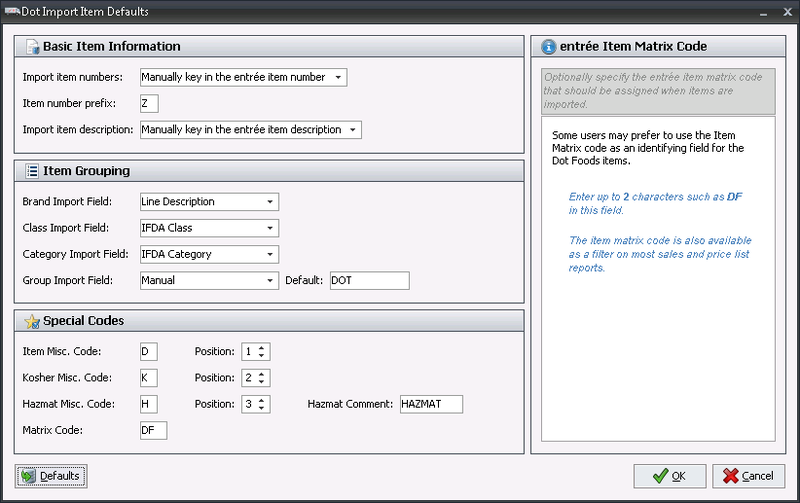 You can also enable Special Order and Drop Ship items to automatically flow into your entrée.NET and Electronic Order Pad applications, as well as overriding these settings on a per item basis. When using entrée.DOT, a new tab is added to Inventory File Maintenance which will display key information from the Dot Foods item catalog. A Control Panel feature is included to help you track all the details as imported from the Dot Foods Catalog. Key values, such as UPC Code, Cubes, Pallet Information, Gross Weight and Manufacturer Item Number will automatically be updated. You can define if the item is sold as a Special Order, Drop Ship item along with the lead time and other important details. The Inventory Search Screen includes a Dot Foods button in the lower left, which toggles the inclusion of Dot Foods items ON or OFF. This is an important feature because when searching for an item, you may or may not want Dot Foods items to be included with your normal items. And when you can import anywhere from 30,000 to over 100,000 items from the Dot Foods Catalog, having all these extra items can make searching more of a challenge. This feature makes the huge volume of these additional items much more manageable to deal with. Note that Special Order Items are displayed with orange text and Drop Ship Items are displayed with brown text in the Inventory Search Screen. 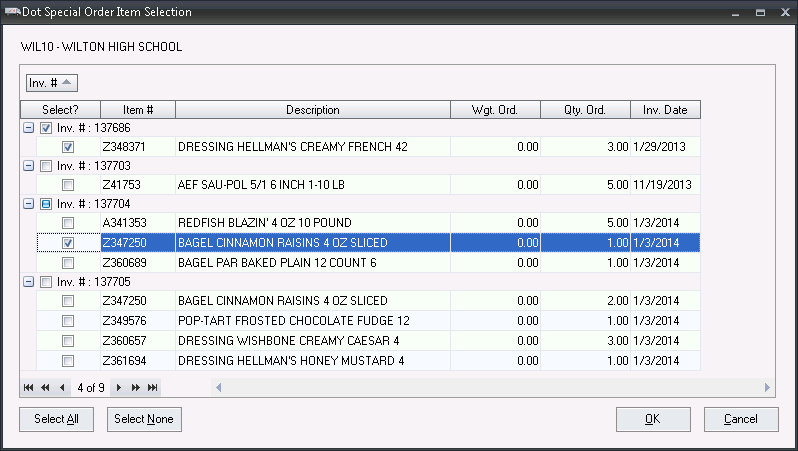 The Dot Foods interface works with entrée to make it fast and easy to create Purchase Orders for your Dot Foods items. When manually creating a Purchase Order in entrée for a Dot Foods vendor, a message box will display if there are open pre-order items that should be included based upon customer invoices. The "Dot Special Order Item Selection" dialog will display so you can select the items you want to add to the Purchase Order. You can click on the item to see the customer who ordered the item in the upper left. Select all the desired Dot Foods items and they will be automatically added to the Purchase Order. With one click the Purchase Order will be electronically sent to Dot Foods. Note that any Drop Ship Items will be shipped to the Ship-To Address as defined on your customer invoice where the item was ordered.